The Beach Hebrew Institute on Kenilworth Avenue. During the past 100 years ago or so there was in 1918-19-20 a couple of historic events which involved the Beach area. One was a world-wide catastrophe, the other was a local issue, but both deserved an historic plaque. One was the First World War and at the same time the Spanish Influenza. The war killed millions. The Spanish Flu worldwide killed more than the war, and it took its toll in Canada and the Beach area. The second was a social issue where, 100 years ago, the Jewish community made their own synagogue; the first in the Beach area. To these two events, the Beach and East Toronto Historical Society deemed each of them worthy of a plaque. We in our local historical society try to preserve all aspects of history as it impacts our area in different ways whether it was 200 years ago, 100 years ago or at the present time – and whether it is an individual, an event or a building. The first plaque concerns an individual, a Beach doctor, William D. Young who helped the poor, the needy and children. Later he helped our young soldiers coming back from the First World War. Many of those soldiers had contracted the Spanish Flu. Dr. Young administered care to these soldiers and caught the flu himself. He died from it, and people were so touched by his devotion they erected a fountain in his honour which is located in Kew Gardens. The fountain is located off the west side of Lee Avenue south of Queen Street. There will be an historic talk on the Spanish Flu by Jamie Bradburn, writer, columnist and historian on Tuesday, Feb. 19, at the Beaches Branch Library from 7 to 8:15 p.m. 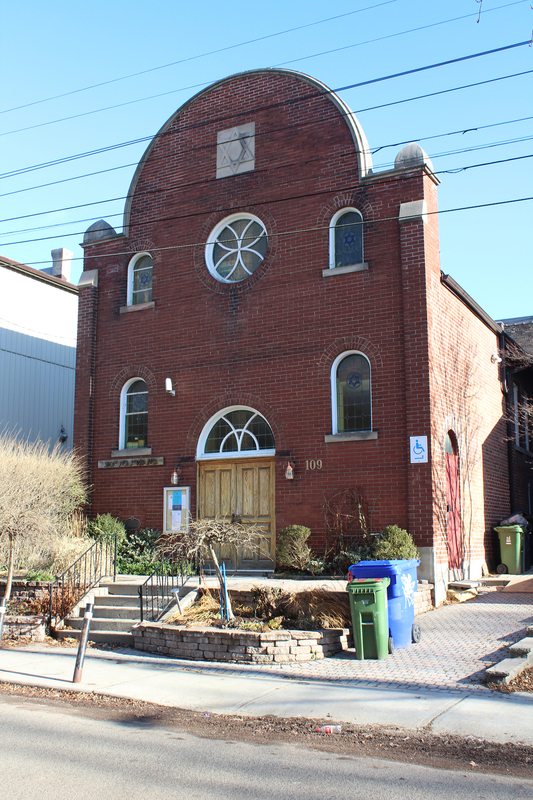 Admission is free and the library is located at 2161 Queen St. E.
The second plaque is on the Beach Synagogue (Beach Hebrew Institute) on Kenilworth Avenue on the east side just south of Queen Street. There are other plaques in our area and there will certainly be more, but we want to bring this to the attention of residents. I have been asked about these particular plaques at the William D. Young fountain and the Beach Synagogue by many Beach residents. So the following is what it says on the plaques. “This Italian Renaissance style drinking fountain was erected in 1920 to the memory of Dr. William D. Young – (1874-1918) by the members of the Beaches community. It commemorates his devotion to public service, and his dedication to the welfare of children in the neighbourhood. The fountain was designed by Maurice D. Klein and originally supported a statue of a standing child by Florence Wylie. Now replaced by one created by Frances Gage. The medallions of Dr. Young were designed by Ivor Lewis. This plaque is located on a stone a few feet north of the fountain. When the plaque was unveiled, members of Dr. Young’s family were present along with members of the Toronto Historical Board. The Beach community was well represented by our local historical society – The Beach and East Toronto Historical Society. This was a tribute to all concerned. “In 1920 the Beach Hebrew Institute was established in this building. It was the former Kenilworth Ave. Baptist Church built in 1895 and occupied until 1905. For nine years it was a community centre known as Kenilworth Hall. Several years later it was acquired as a synagogue. The façade was altered under the supervision of W.G. Hunt to resemble the more traditional ‘SHTIBEL’ architectural style of small European communities and the arched windows and parapets and entrance were added. This historic place of worship is an important part of the Beach community. As it states on the plaque, the building is one of the oldest houses of worship in the area. In 1982 a walk was held to commemorate this event. I, along with members of our local historical society, started from St. Aidan’s Anglican Church and went west to the synagogue. There was a special dedication in front of the synagogue. Mayor Art Eggleton officiated with members of the synagogue with Arie Nerman, members of the Toronto Historical Board, and our local Beaches and East Toronto Historical Society.